E-Governance is defined as the application of electronic means in the interaction between government and citizens and government and business, to simplify and improve democratic, government and business, to simplify and improve democratic, government and business aspects of governance. Many developing country government face these problems of inefficiency, internal and external communications breakdowns, poor service delivery, and corruption. Civil society organizations often lack the capacity to use ICT (Information and Communication Technology) effectively, even though ICT can be a powerful tool for making information available to the public and preventing corrupt practices. "E-government refers to the use by government agencies of information technologies (such as Wide Area Networks, the Internet,and mobile computing) that have the ability to transform relations with citizens, businesses, and other arms of government. These technologies can serve a variety of different ends: better delivery of government services to citizens, improved interactions with business and industry, citizen empowerment through access to information, or more efficient government management.The resulting benefits can be less corruption, increased transparency, greater convenience, revenue growth, and cost reductions." "E-government is defined as utilizing the Internet and the world-wide-web for delivering government information and services to citizens." "Electronic government refers to a situation in which administrative, Legislative and judicial agencies to realize better quality in the provision of public services." "E-governance is more about government than about "e" improves efficiency, improves services helps achieve specific outcomes can contribute to broad policy objectives can be a major contributor to reform can help build trust between governments and citizens can open up the policy process challenges existing ways of working seamless government services will drive agencies closer together." Creating a better business environment: The use of ICT in government and the establishment of an e-government infrastructure helps to create business-friendly environment by streamlining the interaction and improving the interface between government and business. This goal is highly dependent on the country, its industry strength and its global competitive advantage. Once identified, these should be incorporated in the country's e-government strategy, with agencies, the bureaucracy and public services aligned towards promoting these sectors. E-procurement, for example, can open new markets to local businesses by opening up the government procurement process, making it more competitive and fair. Strengthening good governance and broadening public participation: Promoting transparency and accountability in government through the proliferation of ICT in management and operations also opens opportunities for citizens to be more actively involved in the policy and decision-making processes of government. 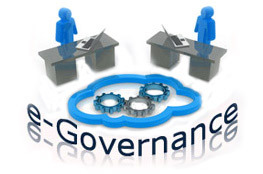 As a major tool in building a tradition of transparency and good governance. e-governance can advance the fight against corruption. However, e-government by itself will not put an end to corruption. It must be accompanied by other mechanisms to be fully effective. Improving the productivity and efficiency of government agencies: It helps to Increase government staff productivity, reduce overhead from fewer offices and less paper management, improve capacity for planning management by government and increase revenue as business and citizens actually apply for more licenses, due to the fact that the process is much easier and less corrupt.Induce cost savings in the medium to the long term. In the short term, however, staffing and costs tend to increase as government must offer multiple delivery platforms (both traditional and e-government) during the initial transition. Efficiency gains: E-government provides benefits to the citizen and to public administration at a number of levels. Significant savings can be obtained in the data collection and transmission as well as in the provision of the information to whole community with this goal. Improving the quality of life for disadvantaged communities: ICT makes it possible for government to reach marginalized groups/communities and improve their quality of life. This means empowering them, through their participation in the political process, as well as delivering much-needed public goods and services. Finally, the goal of e-government is to enhance the interaction between three main factors in the society- government, citizens and business- in order to stimulate political, social and economic progress in the country. Electronic government refers to a situation in which administrative, Legislative and judicial agencies to realize better quality in the provision of public services. Goals of E-governance are creating a better business environment, strengthening good governance and broadening public participation and Improving the productivity and efficiency of government agencies. What is the e-governance project life cycle? What is e-governance? 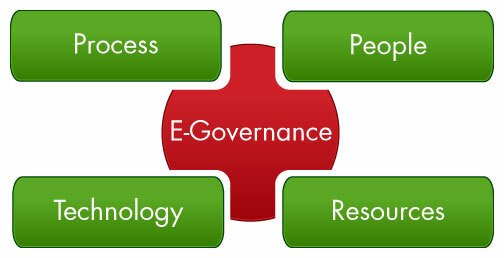 Write any two advantages of e-governance. The government system, which provides information and services to the citizen and organization through electronic media i.e. ICT is known as e-government. It provides greater access to government information. It makes government more accountable and transparent. What are the major areas of e-governance? Differentiate between internal work area and external work area of e-government. It is paperless work in an office by using computers or electronic media. It is the process of providing information to all the citizens through electronic media. They are internal work processing task, account maintenance task etc with in an office. What are the goals of e-governance? Why is e-government getting more and more popular nowadays? E-government is getting more and more popular now a days because of ICT & internet playing vital role in the daily lives of people of every sector such as e-commerce, e-business, e-Banking, e-education, e-learning etc. Which of the following does not fall under goals of E-governance? Improving the quality of life for disadvantages communities. What is the full form of ICT? E-Governance is defines as ______. Utilizing the Internet and the world-wide-web for delivering government information and services to citizens. Using computer by government for their own purpose. What is the full form of "E" in E-governance? The use of ICT in government and the establishment of an ______ infrastructure helps to create business-friendly environment by streamlining the interaction and improving the interface between government and business. Any Questions on 'Introduction and Goals of E-Governance '?